Pro se applicant Anthony S. Pimpo was thwarted in his attempt to register the mark RAMBLER for automobiles and parts. Although the old Nash mark has been abandoned for decades with regard to automobiles, the Board found that use of the mark on licensed goods (like key rings, calendars, and owner's manuals) beginning in 1995 provided a sufficient basis for a likelihood of confusion finding. Chrysler LLC v. Pimpo, Opposition No. 91171962 (July 30, 2008) [not precedential]. Opposer's predecessor-in-interest began using the mark RAMBLER for autos in 1900, but manufacturing stopped in 1969. There was no evidence of record of any plans to resume use of the mark for automobiles. Opposer pointed to "the reintroduction of 'heritage' brands in the automotive industry, and the existence of several car enthusiast clubs dedicated to the RAMBLER automobile." But the Board saw no evidence of any plans to reintroduce the RAMBLER auto, and it observed that the existence of enthusiasts' clubs does not alone overcome the statutory presumption of abandonment after nearly 40 years of nonuse. As to Opposer's argument that the RAMBLER mark enjoys "residual goodwill" and is therefore not abandoned, the Board found the evidence insufficient. "Here, the period of almost four decades of nonuse on automobiles presents a persuasive case for abandonment." Turning to the issue of licensing, the Board considered "all the pieces of the puzzle" and concluded that Opposer had established a priority date earlier than Applicant Pimpo's 2005 filing date. 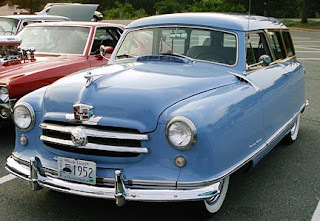 Opposer's testimony regarding licensing was a bit of a mess, but the Board ruled that Opposer "has priority of use, at the very least with respect to key rings, calendars, decals, specification sheets and owner's manuals, all relating to RAMBLER automobiles." Next the Board found these licensed, collateral products to be sufficiently related to automobiles "so that consumers would ascribe a single source to the products." "In the present case, we cannot ignore the fact that purchasers of opposer's licensed goods or applicant's automobile may be buying such goods because they know of the earlier RAMBLER automobile, and these purchasers would view both types of goods as originating from the same source, namely the manufacturer of the old line of RAMBLER automobiles." TTABlog comment: So there is not enough residual goodwill to avoid abandonment of the RAMBLER mark for automobiles, but there apparently is enough to cause consumers to associate ancillary goods with the old automobile. I guess one can eat his cake and have it too. IP expert Pam Chestek provides her thoughts on "heritage" licensing at her new blog called Property, Intangible (here).